The KRF, the best army side of that period proved too strong for the inexperienced Spartans, even if with the slope in their favour they held the opposition to a narrow lead of 0-1, and had what looked like a legitimate goal disallowed for an apparent infringement. In the second half, with the slope against, the Spartans succumbed to the better side of the KRF and conceded another three goals, with the final result of 0-4. The ground at tal-Pieta’ had an infamous slope which impinged negatively on the side playing against it. First Cup – National Ground Cup Sensing the interest from the local supporters, the owners of the aforementioned National ground organized a competition between the best squads on the island at the time, amongst which featured the Hamrun Spartans team, which was quickly establishing itself as one of the elite clubs in Malta. Hamrun which were given a ‘bye’ for the first round, were subsequently drawn against the mighty Floriana squad for what had to be a thrilling semi-final. 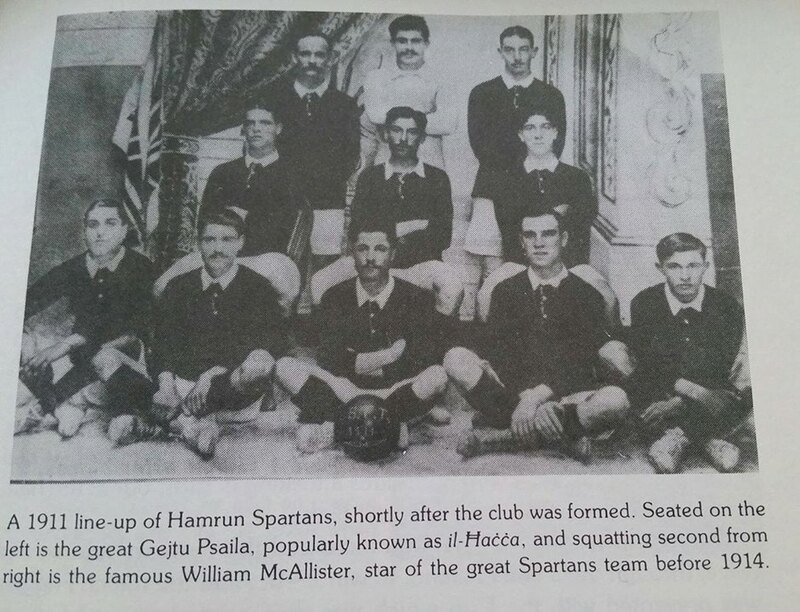 This was the first (out of many) encounters between the two throughout the history of Maltese football. The game attracted huge crowds from both sides and took place on the 16th of April 1911 and kicked off at 15:30. The first half left the supporters breathless as Floriana went in front after just a few minutes. However the Hamrun side playing with black shirts and white shorts retaliated with force and scored three consecutive goals. A few minutes before half time Floriana narrowed the gap with another goal, for the partial result of 3-2 in favour of the Spartans. The second half started with a frenetic pace with Floriana doing their utmost to grasp the equaliser, with the referee having to stop the game several times due to the number of fouls and infringements. Four minutes from time Floriana’s Ruggieru Friggieri let a powerful shot after a solo run into the Hamrun defence. The ball hit the hands of one of the Hamrun defenders, and the referee awarded a late penalty which was converted by Friggieri. The final whistle was blown, and the Floriana players were preparing for extra-time, however the exuberant Spartans’ supporters had other ideas. For the Hamrun faithful, the result was a huge success when considering that this was the first real competitive match for them, against the already established and well renowned Floriana squad. Needless to say that the Hamrun faithful were in jubilant mode after this result, and didn’t think twice to invade the pitch and carry their heroes on their shoulders to the neighbouring streets of Hamrun. Though the event showed the hot-blooded nature of the Spartans’ supporters it inevitably cost them the opportunity to pass on to the final against their other eternal rivals, Valletta United the following month.